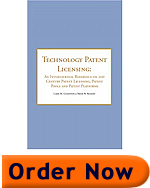 There is a generic problem relating to aggregated licensing of patent rights. On the one hand, aggregated licensing offers a group license to many essential patents at a price that is reasonably acceptable to both licensors and licensees. On the other hand, the combination of competing companies in the aggregated offer creates potential for market abuse and violation of the antitrust laws (as they are called in the United States, or “competition laws” as they are called in Europe). To achieve the benefits and avoid the harm, regulatory authorities create conditions for the kinds of patents that may enter the patent pool, and for the behavior of the licensing administrator who acts as a licensing agent for the competing companies who have aggregated their patents. Chapter 5 discusses the antitrust law of three jurisdictions, as such law applies to aggregated licensing. In particular, there are discussions of sections 1 and 2 of the United States Sherman Antitrust Act, Articles 81 and 82 of the EC Treaty of Amsterdam, and sections 3 and 6 of the Japanese Antimonopoly Act. The 3G Patent Platform obtained positive rulings from all three antitrust authorities prior to launch. Chapter 5 discusses also the U.S. Department of Justice Business Review Letter, the EC Comfort Letter, and the Japanese Viewpoint Letters, which were obtained by the Platform from the regulatory authorities.